Ian Quick, a second grader, explores one of his classroom’s new Chromebooks. Cassville second graders (left to right) Jaxon Winfrey, Wyatt Privett and Alexandra Holycross kick back in the classroom on their Chromebooks. Cassville R-IV realizes technology in the classroom is no longer a luxury, but a necessity and is taking steps to continue to expand the use and availability of technology to students. Beginning this year, first and second grade classrooms now have their own class sets of Google Chromebooks. “In previous years, our elementary students have had access to laptop carts, including both laptops and iPads. 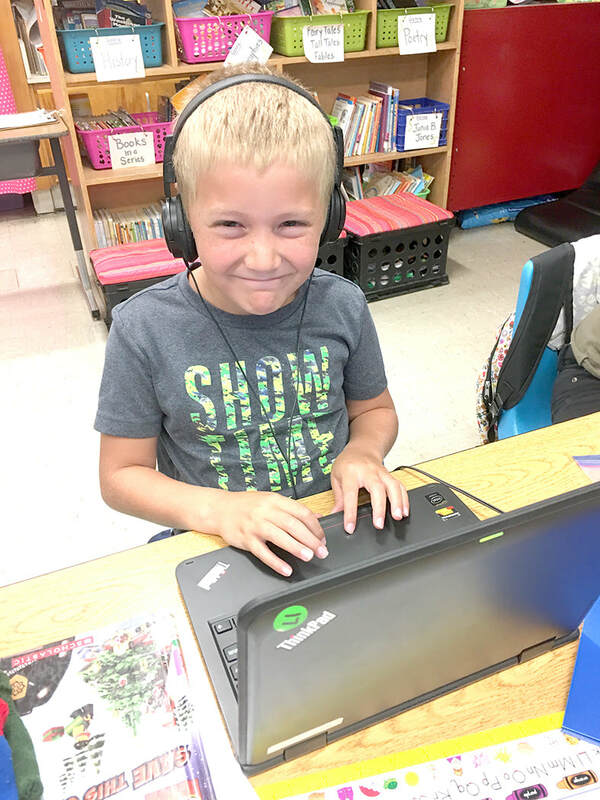 This year, however, marks the first year every first and second grade classroom is fully equipped with their own classroom set of Google Chromebooks,” stated Dr. Richard Asbill, Cassville R-IV Superintendent. As students at Cassville High School transition to new devices, the district is able to take advantage of the device turnover and provide updated technology to younger students. Elementary children will not be permitted to take their devices out of the classroom.